That’s right, after biscuits, creamy chicken pasta, and more pasta (con pesto), I bring you this deeeelicious fiber-full, protein-stuffed gem. I know, you think I’m insane and that weird green leafy thing with the little sprinkling of grain doesn’t look remotely appetizing. But that’s where you’re wrong! It is sweet and salty and crunchy and chewy and super filling. Give it a try. Go on. 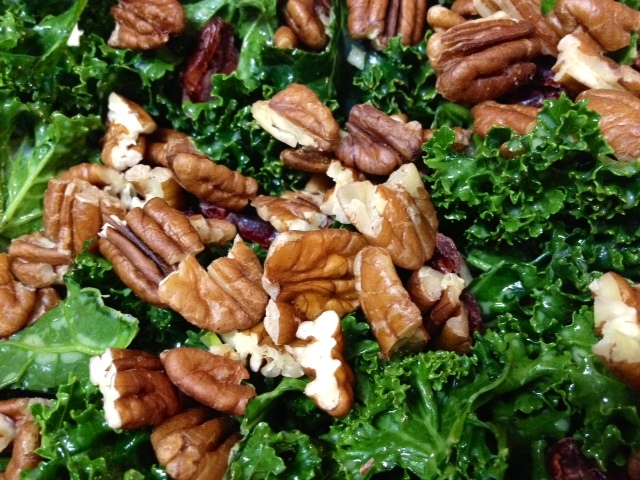 We’ve already discussed my love of kale. If you don’t share that love…well, you’re wrong. But I forgive you. Just give it a few chances—it just has to be prepared correctly. First, bring water to a boil in a saucepan. Stir the quinoa into the boiling water, reduce heat to medium-low, cover, and cook until the water absorbs into the quinoa, about 12 minutes. Remove the saucepan from the heat and let rest covered for about 5 minutes. Take the lid off and let the quinoa cool completely. I threw mine in the fridge, but you could make it ahead of time too. Also, you could definitely use a rice cooker. 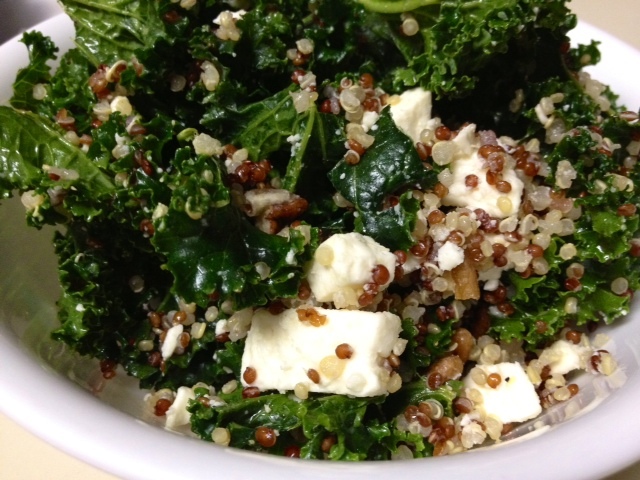 I’ve tried it before and my quinoa’s always overdone, but always an option. 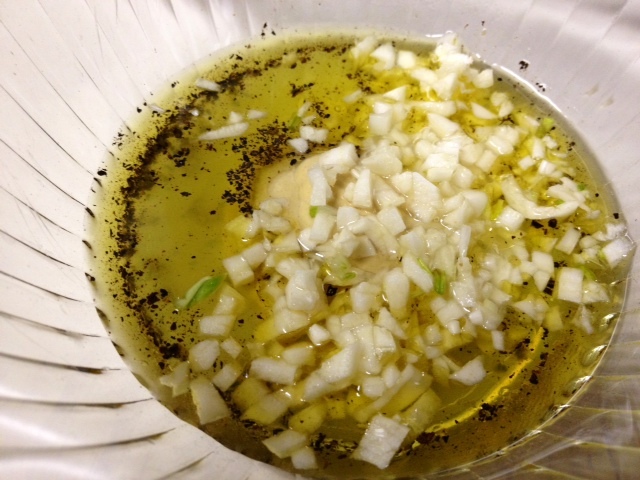 Mince up some fresh garlic. Fresh is better, has all the good stuff in it. 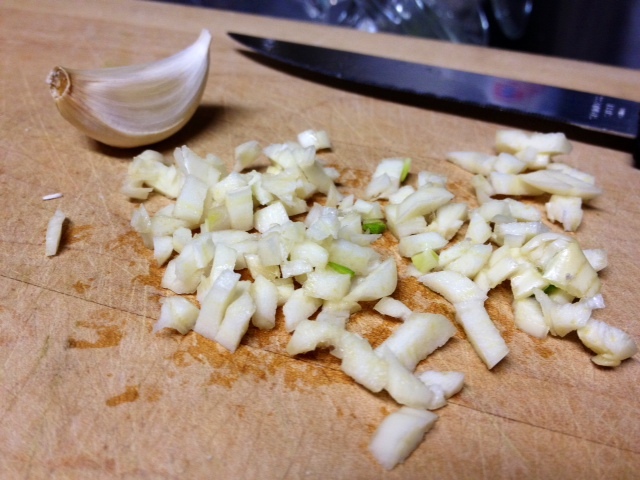 As you can see by the giant garlic pieces, my knife was terrible, but I have pretty, shiny, sharp new knives in my new condo. Grown-ups for the win! 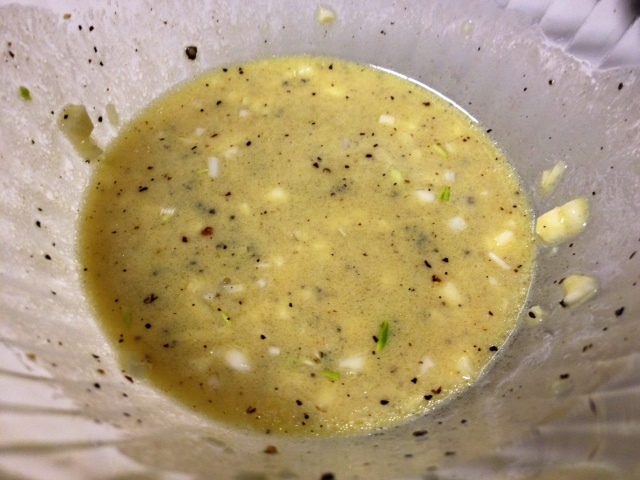 In a small bowl, whisk together the olive oil, lemon juice, Dijon mustard, garlic, pepper, and salt until the oil oil emulsifies into the mixture. 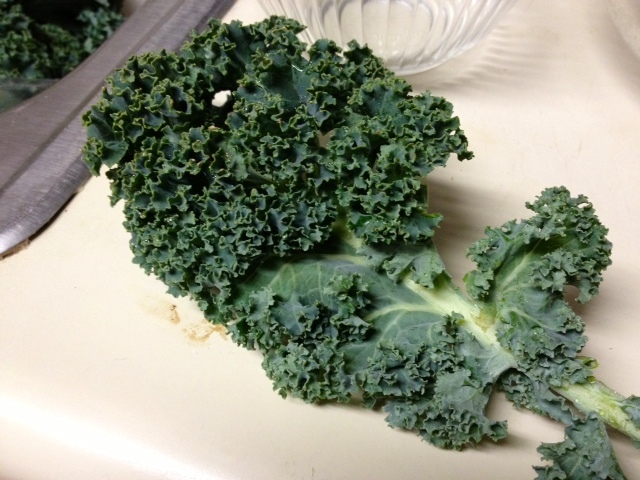 Put the torn kale in a large mixing bowl and drizzle the dressing over the kale. 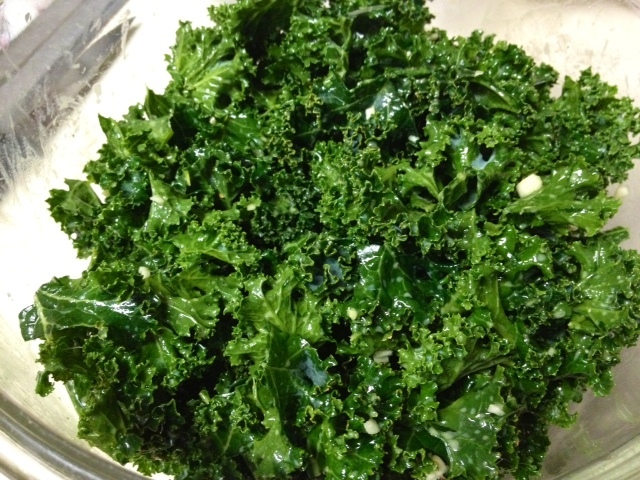 With your hands, massage the dressing into the kale, with a little extra sea salt to help work it into the leaves. Really give it a good working over. Deep tissue-style. It makes the leaves all nice and tender. 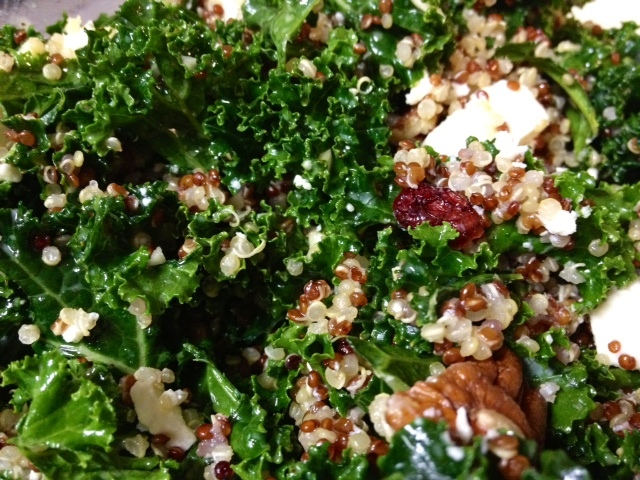 Finally, add the cooled quinoa, pecans, currants, and feta cheese to the dressed kale and toss everything to incorporate. Or stir, if you’re super messy like me. And then you have a healthy dinner! Or snack. Or whatever. 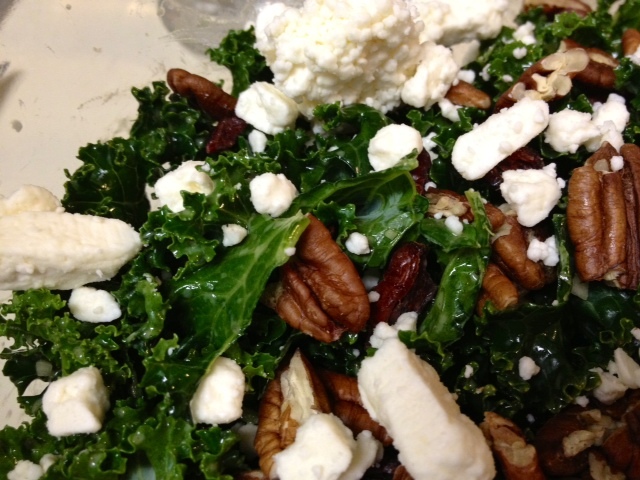 I loved the flavors and texture, and the craisins added a cool sweetness to the salty feta cheese. It was really filling but didn’t make me feel full. Bring water to a boil in a saucepan. Stir quinoa into the boiling water, reduce heat to medium-low, place cover on the saucepan, and cook until water absorbs into the quinoa, about 12 minutes. Remove saucepan from heat and let rest covered for 5 minutes. 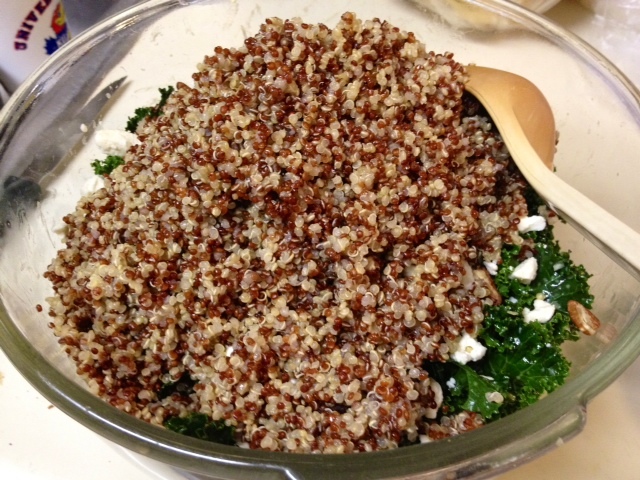 Remove cover and allow quinoa to cool completely. 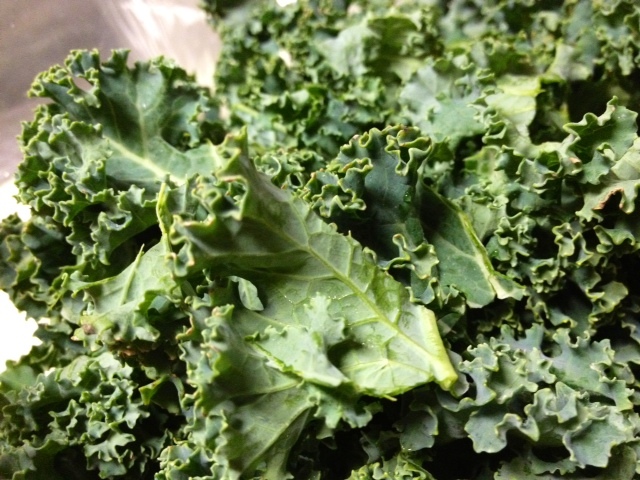 Whisk the olive oil, lemon juice, Dijon mustard, garlic, pepper, and salt together in a bowl until oil emulsifies into the mixture, then drizzle over the kale. 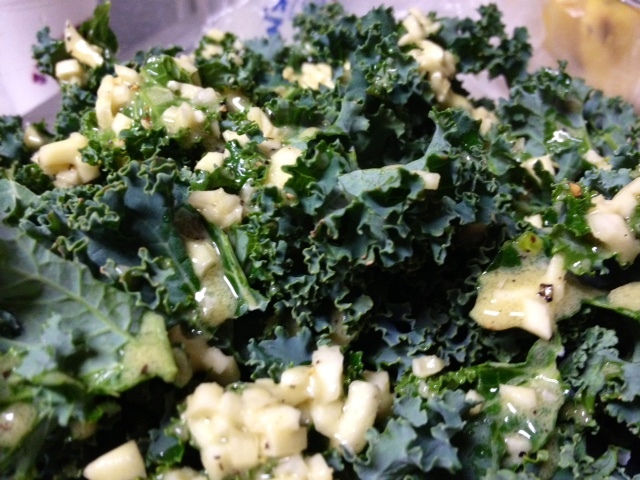 With your hands, massage the dressing into the kale (with a little extra sea salt). Really work it in, it tenderizes the leaves and makes them nicer to eat. 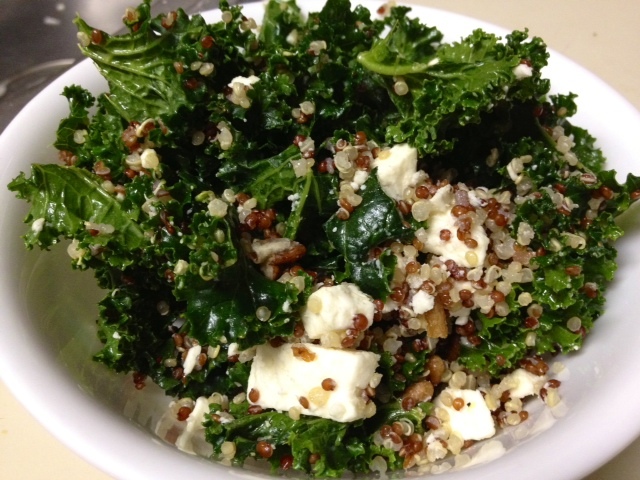 Add cooled quinoa, pecans, currants, and feta cheese to the dressed kale and toss to incorporate.